Beat SCAD launches fundraising event – Scones for SCAD! 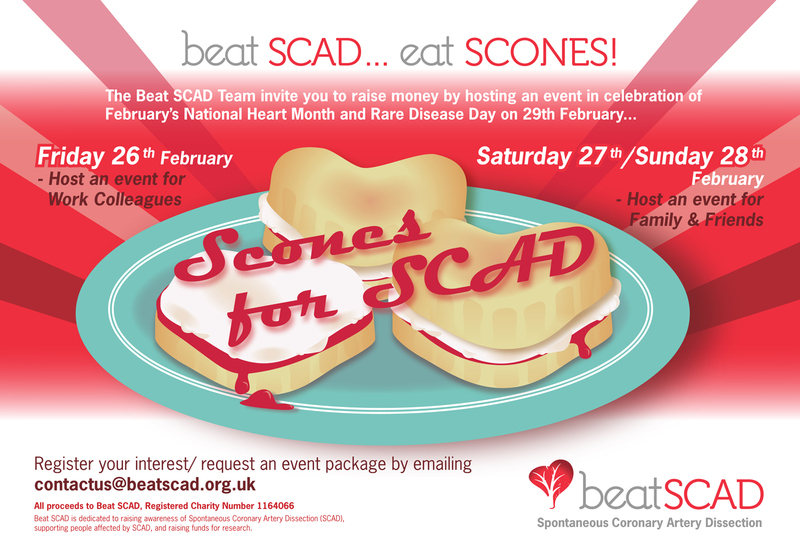 To celebrate February’s National Heart Month and Rare Disease Day (29 February), Beat SCAD has launched Scones for SCAD! We’re asking SCAD patients, family, friends and supporters to host scone-themed events on 26 February and 27/28 February to raise money for Beat SCAD and raise awareness of Spontaneous Coronary Artery Dissection. Bake and sell scones, hold raffles, have competitions or auctions… you choose! Our information pack provides more details as well as tips and resources to make your event a success. If you’d like to receive the information pack and find out more about hosting an event please contact us. You need to register your event by 4 February, so email us as soon as you can! You can also buy merchandise to help raise awareness of SCAD. Details are in the Scones for SCAD pack and you’ll need to place your orders by 4 February to make sure they arrive in time for your event. Don’t forget to let us know about the event and send us photos!